In a recent issue of the Highland Woodturner, Curtis Turner (what are the odds?) showed how to make a simple spray painting turntable out of MDF and some dowels. I thought, “hmm, that would beat the heck out of some nails pounded into a board that I usually end up cobbling together whenever I need something like that.” Plus I figured I had an extra lazy Susan bearing I had purchased for my tablet holder which I didn’t end up using. I started by tracing 8″ and 12″ circles on some scrap MDF with a compass, I chose these two dimensions based on the size of the scrap I had available. 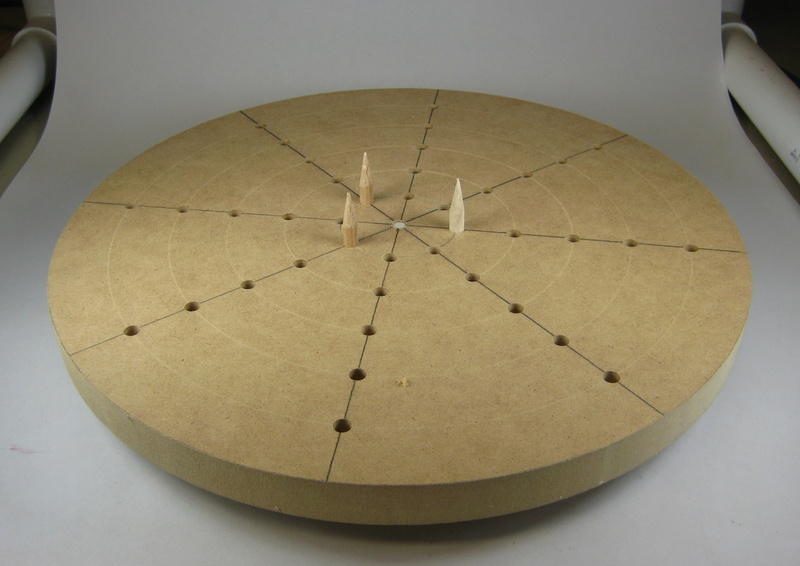 Then on the 12″ circle, I drew concentric circles of 10″, 8″, 6″, etc to aid in placing the holes. To finish locating the holes, I drew two perpendicular lines through the center. Later, when I figured I needed more holes, I drew more lines at 45°. 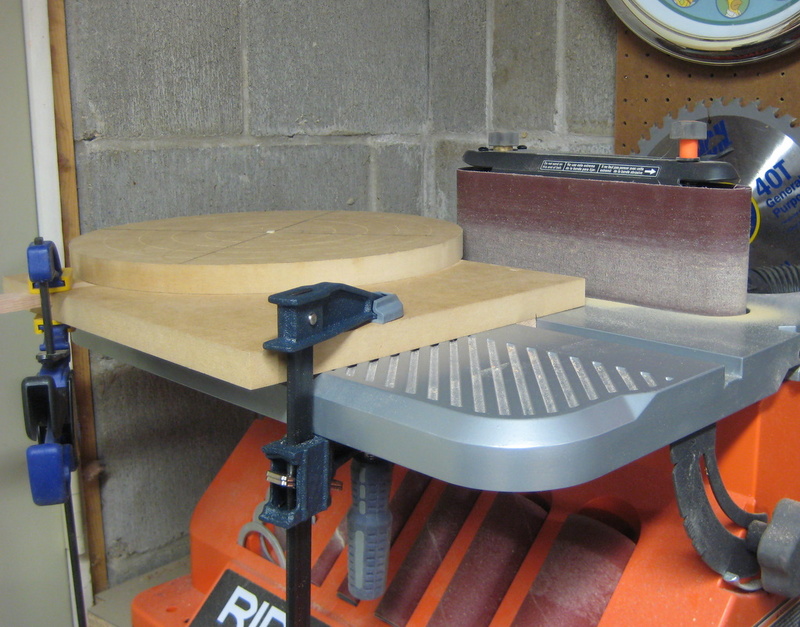 I cut the circles out on the scrollsaw with a pretty coarse blade (5 or 7 tpi), then I ended up making a jig for my oscillating sander to sand the blanks into perfect circles.I had planned on using a lazy Susan bearing, but I found that the top circle spun freely on top of the bottom one with only a 1/4″ dowel for an axle. I set the depth stop on the drill press to 3/8″ and preceded to drill all the holes I had marked. I didn’t want drill all the way through the top, because I didn’t want any paint or finish running between the two discs and ruining the spinning action. Finally, after a few minutes of thought, I figured out that I could use a pencil sharpener to point the dowels, rather than figure out some more complicated way. I spy a HF clamp… what do you think of it? After the discussion in the comments of this post: http://workshop.electronsmith.com/content/issues-clamping I decided that the harbor freight F-clamps were the least bad of the non-Jorgensen ones. So I picked up two 18″ clamps last time I was at HF and I’ve used them a few times. First off I wish I would have bought the shorter clamps. I bought the 18″ ones because I figured they’s be a good all purpose size, but the bar gets in the way a lot of times. I’m not sorry I bought them, I do need longer clamps now and again, but I need less than 6″ of jaw capacity for most jobs. I like the deeper jaws — that’s the reason I’m using it in the above picture. I really don’t find using them any faster or slower that the quick clamps and I can crank them down much tighter. They’re much cheaper than the quick clamps, even at the best sale prices. I think they are at least as sturdy too. The jaws don’t wobble like some of the other alternative F-Clamps. In short I’d definitely recommend them, and I’d say get the shorter ones unless you have a particular use in mind. I’ll be picking up a few next time I’m at HF.